With the global video games market worth almost $100 billion, and Africa, Europe and the Middle East contributing $23.5 billion to the pot, it’s clear that gaming is good business. This alone is a great reason for local indie studios to develop their own games and showcase them at rAge, via the popular home_coded stand. They’re doing it with heart too, because some of the local developers are not only interested in their sharing passion for gaming, but are also giving back to some seemingly unlikely local causes. Mattador Starfish is a local game development studio focusing on bringing sustainable change to people's lives. The company will be showcasing its first game, Codex Knights. It’s a 3D action-RPG/puzzler designed to encourage and promote reading across all ages, but it’s particularly aimed at kids and teenagers. Codex Knights is being designed to immerse you in the worlds of fantastical books, where the participants can explore these worlds and interact with the characters and events in the book. Exciting news is that one of their first books is focused on a South African classic – Jock of the Bushveld. Another exhibitor, Givit Game Studios, will be officially launching its first commercial release at rAge, titled The Adventures of Sam Carlisle: The Hunt for the Lost Treasure. Two years in the making, and featuring the musical talent of Pieter Smal and the voice of South African actor Deon Coetzee, this game raises awareness on Alzheimer’s, as the main character suffers from the disease. As the game progresses, he can’t distinguish between reality and fiction. The developers will be donating a portion of earnings from the game to a relevant charity. home_coded veterans Celestial Games will once again be at the expo. Exciting news for visitors is that this year Celestial will be doing "live game development" on their stand. Visitors will be encouraged to participate in an experimental and innovative approach to game jamming, which will involve audience engagement platforms such as an active hashtag and a suggestion wall for visitors to draw, write and scribble on. Visitors can contribute ideas, criticisms and content that will potentially feature in the game. This interactive model facilitates a “living game”. You'll be able to track its progress and evolution throughout the weekend, and the game will inevitably change and adapt as audience contributions are implemented. Another local developer bringing the awesome to rAge is Robot Wizard. The company recently had a successful trip to Gamescom in Germany, and now the time has arrived for local fans to get their hands on Jengo! For the first time on African soil, Jengo’s Gamescom demo will be playable at rAge, which will also give attendees the opportunity to share their thoughts on the game with its developers. In addition to this, rAge visitors will also be able to audition for a chance at becoming the voice of Jeff, the game's protagonist, when Robot Wizard launches #FindingJeff at the show. And lastly, a campaign to "help feed a child" through gaming. Organosphere will be showcasing their indie game which goes by the same name: Organosphere. It tells the story of a scientist who wakes up to a reality they don’t understand, venturing into the heart of Johazardousburg and its lush environments to discover the meaning of all existence as we know it. 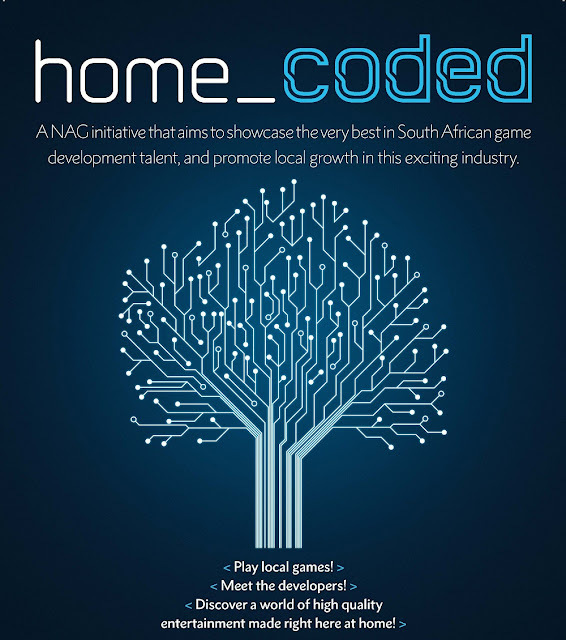 home_coded is an initiative that was started by NAG in November 2012, with an aim to showcase the very best in South African game development talent, and promote local growth in this exciting industry. Not only can you meet the local devs and interview them at rAge, but you’ll be able to play all their latest games that are still in development.